OK, that was completely unnecessary. And yes, I now own a sewing machine. I've owned it for two weeks now, but it's all very hush-hush. I mean, it's nice. It's white. It has S-I-N-G-E-R written on it, in red. A few frightful knobs, an unfriendly needle. An intimidating stance. Actually, I think it's a bit of a snob. I stare at it. It stares back. And that's pretty much all we've done since it got here. I have designs whirring around my head. Scraps of fabric. A table that is just the right height. Tapes, threads, buttons, scissors. Three books on sewing, each heavier than the sewing machine. It's all there. But still, we sit and stare. I really wasn't expecting myself to be such a wimp about this. In my head, I was fearless. I saw myself churning out covers for my cushions, and dresses for my daughter. I thought sewing would be genetic. Ma is a bit of an elf with a sewing machine. I grew up wearing the prettiest, most fashionable clothes in the neighbourhood. Clothes that she would toss up, casually, without a pattern in sight. I would wear dresses with details that made other mothers weak in the knees. But, Ma wouldn't let me anywhere near her beloved old machine. Or her little haberdashery cupboard. So now, I know nothing. (Ma, it's all your fault. ) For three years, I've been standing in toddler playgroups, singing 'wind the bobbin up', thinking it was some old Victorian toy. Nah, says Singer Manual. Anyway, after weeks of sub-zero silence, Singer and I managed to break the ice today. We wound the bobbin, threaded the needle and shook hands. I'll let you know how we get on. I just need to dig in. Get my hands dirty. But between all the hemming and hawing, I did dig into something else. A pumpkin. Plump, and round, and orange. Like a warm, portly aunt. No knobs, no needles. So, I cut it open, dug out its the seeds, and got my hands dirty making dukkah. 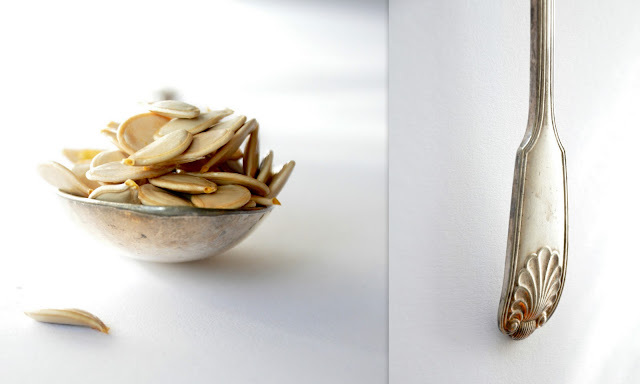 Dukkah is an Egyptian eat - a blend of seeds, nuts and spices which are coarsely ground to release a heady flavour. Served with bread and olive oil. As for the ingredients, I used things that I had at home. Feel free to use other seeds, or nuts, and tweak the spices. Dukkah is highly adaptable. 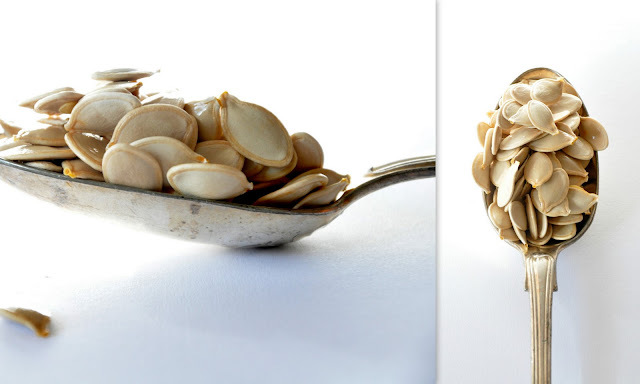 If you're using fresh pumpkin seeds, like I did, you need to boil the seeds in water, with a bit of salt, for 10 minutes. Or you could use pumpkin seeds off a shelf. Put a flat pan on medium heat and dry-roast all the ingredients, except the sea salt. Stir constantly till the seeds, nut and spices give off a lovely roasted smell, and are lightly browned. Remove from heat and add salt. Now, using a mortar and pestle, or a food processor, grind everything. Dukkah is best ground coarse, but feel free to choose the texture you prefer. I did it in two batches - one very coarse, and one quite fine. Serve with bread and extra virgin olive oil. Dip the bread into the oil and then into the dukkah. Enjoy. You can store the dukkah in an airtight container. And there I was expecting a blog about bright blue weekend and new explorations :)). You will have to introduce us: me and your new white friend (?) ;) I just loved it how you wrote it, and when your mom reads your blog and comes to you to teach that skill of casual throwing of amazing garments together, please please ask her to count me in on the experience. Pretty please. dalia, i just dug out an old pillowcase, and am off tame this monster, so wish me luck. for the advanced course in sewing, we'll have to book flights to calcutta. Oh, my. Your words and photos are poetry in motion. When I was a little girl, I wanted to be a fashion designer [far second to becoming a mermaid]. I didn't pursue either dream...but I know how to open up a pumpkin! I made this today without nuts [only because I had to satisfy my ID and going to the store to get pistachios would make the ID unhappy]. So yummy! Thank you so much. I used the seeds from the spaghetti squash I cut open ;-). love it esp pumpkin segment pic ! i walk in your photographic shadow again Pia ! porkypig: oh gosh, thank you for such a lovely comment! i'm thrilled you like it.